Studio Heliva presents accommodation in Dubrovnik, 1. 7 km from Onofrio's Fountain, and visitors advantage from gratis wireless internet and private car parking available on site. There is a dining area and a kitchen as well as a private toilet. Towels and bed linen are provided in this apartment. 7 km from Studio Heliva, while Stradun is 1. The closest flight terminal is Dubrovnik Airport, 17 km from Studio Heliva. 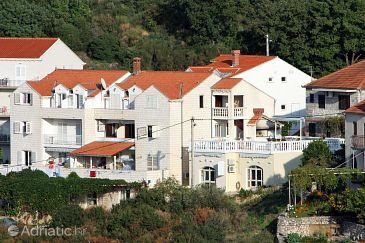 Apartment Ada & Mia ~0,1 km, Dubrovnik price per day from € 57 It presents air-cooled apartment with gratis wireless internet access. Featuring a bathtub, private toilet also comes with a washing machine and a hairdryer. Free car parking is possible upon request at a location not far away. Studio Heliva ~0.1 km, Dubrovnik Studio Heliva presents accommodation in Dubrovnik, 1. 7 km from Onofrio's Fountain, and visitors advantage from gratis wireless internet and private car parking available on site. There is a dining area and a kitchen as well as a private toilet. Towels and bed linen are provided in this apartment. 7 km from Studio Heliva, while Stradun is 1. The closest flight terminal is Dubrovnik Airport, 17 km from Studio Heliva. Lapad ( ~ 1.4 km ): 656+ apartments. Mokosica ( ~ 2.6 km ): 63+ apartments. Zaton Dubrovnik ( ~ 6.2 km ): 194+ apartments. Kolocep ( ~ 7.3 km ): 17+ accommodation units. Orasac ( ~ 8.9 km ): 36+ apartments. Srebreno ( ~ 9.1 km ): 163+ apartments, 9+ villas, 8+ hotels. Beach Hotel Bellevue Dubrovnik ~ 0,7 km from Studio Heliva Sandy beach: ideal for families, recommended for young people, with restaurant, with caffe bar, equipped with showers. Excellent choice of watersports. Beach Dance, Dubrovnik ~ 1,4 km from Studio Heliva Rocky beach: with restaurant, with caffe bar, equipped with showers. Beach Penatur ~ 1,5 km from Studio Heliva Rocky beach: with caffe bar. Beach Lapad, Dubrovnik ~ 1,9 km from Studio Heliva Sandy beach: ideal for families, recommended for young people, with restaurant, with caffe bar, equipped with showers. Excellent choice of watersports. Beach Buza, Dubrovnik ~ 2,1 km from Studio Heliva Rocky beach: recommended for young people, with caffe bar. Restaurant Konoba Ekvinocijo, Dubrovnik Guest reviews: 8,2/10 ~ 2 km from Studio Heliva Address: Ilije Sarake 10, Dubrovnik. Cuisine: Croatian cuisine. Restaurant Azur Dubrovnik, Dubrovnik Guest reviews: 9,2/10 ~ 2 km from Studio Heliva Address: Pobijana 10, 20000, Dubrovnik. Cuisine: Mediterranean cuisine, Fusion, Asian cuisine fusion. Restaurant Konoba Jezuite, Dubrovnik Guest reviews: 8,5/10 ~ 2 km from Studio Heliva Address: Poljana Rudjera Boskovica 5, Dubrovnik. Prices: 56 HRK - 140 HRK. Cuisine: Mediterranean cuisine, Croatian cuisine. Restaurant Cafe Bar Bard, Dubrovnik Guest reviews: 10/10 ~ 2 km from Studio Heliva Address: Kneza Hrvasa 11, Dubrovnik. Cuisine: Contemporary, Bar. Restaurant Kopun, Dubrovnik Guest reviews: 9/10 ~ 1,9 km from Studio Heliva Address: Poljana Rudera Boskovica 7, 20000, Dubrovnik. Cuisine: Croatian cuisine.